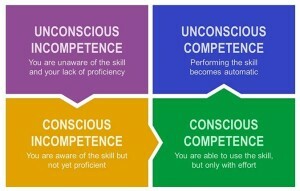 Perhaps you have seen this common learning model illustrated in the diagram? 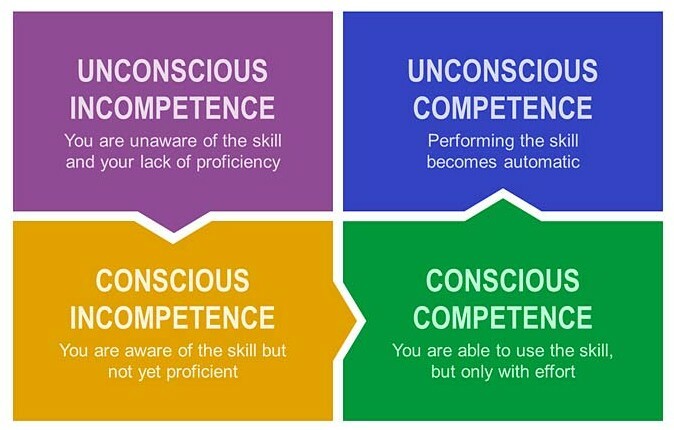 The idea is that when we learn a new skill we start at a point where we are unaware of how bad we are at a particular skill – be it driving a car or playing a musical instrument (unconscious incompetence). As we start to learn, we realise that in fact we can’t do the thing – and so we’re at the level of conscious incompetence. But then over time we improve – so that with conscious effort we can do the thing. And when we have truly mastered it, there is a sense in which we can carry out the skill without thinking – an unconscious competence. As I was reading Psalm 148 today I was struck by the way that learning model could apply to our worship of our Creator. The call of Psalm 148 is for all the elements of His Creation to praise God – and there must be a sense in which they do that automatically. But for human beings the picture is different. In our natural state we are unaware of the praise, worship and thanks we owe to God (we have no excuse, Romans 1:18-23, but there is a sense in which our eyes and minds are darkened and we don’t see things rightly). As the Spirit works in us to draw us to Christ we realise our sin, and the way in which we have failed to give God the glory He deserves. When we are re-born we move to a position of conscious competence in praise. We realise that there is a God, that He has done wonderful things for us and we are able to praise Him. But perhaps for many of us, this is something which happens only when we remember – when we gather with other believers, or when we are specifically focusing on a time with God. But a day is coming – and we get a sneak preview in the book of Revelation (e.g. Rev 4:6-11) – where the praise will be so much a part of us that it will be an unconscious competence. I long to move towards that state in this world. So that I am walking so closely with God that His Praise is always on my mind or lips. So that I am always mindful of the thanks I owe Him and my dependence on Him. I’ve got a long way to go – but the Holy Spirit has the same plan for me, to make me more like Jesus, so progress is possible!